I had a phone call last week from the people at BBC Countryfile. They are putting together some future programming based on Dorset and wanted to meet with me to discuss it and so that I could give them a guided tour of Dorset’s wonderful Holloways. I am still processing the pictures from the visit but I thought I would reblog this entry on Holloways that I posted earlier this year. The programming is still in the development stage and it may be several months before we know if it will go ahead but it was good to meet with them and show them our beautiful county. I will put up a fresh entry with more pictures of these amazing places soon. There are thousands of ancient paths criss crossing Dorset’s wonderful countryside but none more fascinating than these labyrinthine paths like the one in the picture above which goes by the interesting name of Hell Lane! 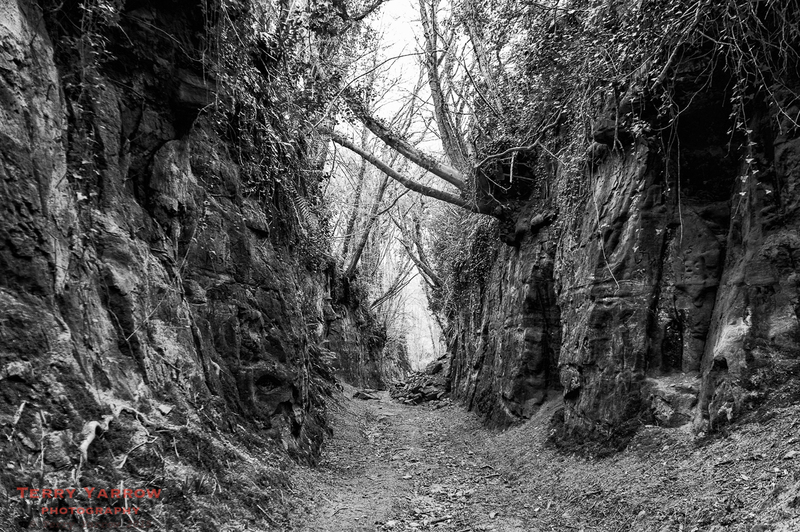 These are known as Holloways, although they do have other names such as shutes, bostels or grundles depending on the area they are in, and they are only seen in areas where the bedrock is soft – West Dorset is predominantly sandstone and therefore has many Holloways. I’m doing an assignment at college on how the British landscape has changed and have been looking for information on Holloways and your blog gave me the extra information I needed, with your permission I would like to include some of the information from this article in my assignment, you will be reference. Hi Sam. Yes, that’s fine as long as it is for a college assignment only. Hope it goes well.